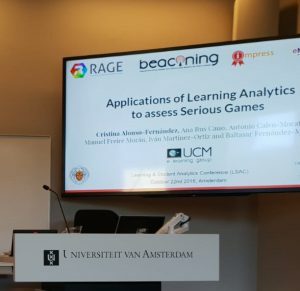 During the 2nd Annual Learning & Student Analytics Conference, held in the University of Amsterdam, The Netherlands, during October 22-23 2018, Cristina Alonso Fernández (UCM) presented some of the latests work done by the e-UCM research group regarding the application of Learning Analytics for Serious Games. A. Validate and deploy games in schools. The SG Conectado has been designed to address social problems (bullying and cyberbullying). B. Validate game design when information cannot be directly gathered from users. The SG Downtown was designed for improving independent life of users with Intellectual Disabilities (ID) who struggle with communication issues. C. Improve evaluation and deployment of games. 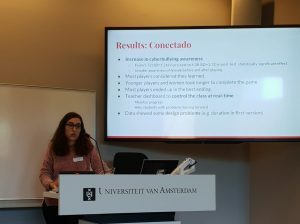 The SG First Aid Game was already validated and data mining models were applied to predict knowledge after playing. All three games have been tested with target users in actual classrooms, as described in the following section. Results and implications of the use of analytics in those three scenarios are later explained.